• The Internet was designed to be a decentralized system: every node should connect to many others. This design helped to make the system resistant to censorship or outside attack. • Yet in practice, most individual users exist at the edges of the network, connected to others only through their Internet service provider (ISP). Block this link, and Internet access disappears. • An alternative option is beginning to emerge in the form of wireless mesh networks, simple systems that connect end users to one another and automatically route around blocks and censors. • Yet any mesh network needs to hit a critical mass of users before it functions well; developers must convince potential users to trade off ease of use for added freedom and privacy. Just after midnight on January 28, 2011, the government of Egypt, rocked by three straight days of massive antiregime protests organized in part through Facebook and other online social networks, did something unprecedented in the history of 21st-century telecommunications: it turned off the Internet. Exactly how it did this remains unclear, but the evidence suggests that five well-placed phone calls—one to each of the country’s biggest Internet service providers (ISPs)—may have been all it took. At 12:12 a.m. Cairo time, network routing records show, the leading ISP, Telecom Egypt, began shutting down its customers’ connections to the rest of the Internet, and in the course of the next 13 minutes, four other providers followed suit. By 12:40 a.m. the operation was complete. An estimated 93 percent of the Egyptian Internet was now unreachable. When the sun rose the next morning, the protesters made their way to Tahrir Square in almost total digital darkness. These routers form one node in a nonprofit community network called FunkFeuer, of which Kaplan is a co-founder and lead developer. The signals that the routers beam and pick up link them, directly or indirectly, to some 200 similar nodes on rooftops all over greater Vienna, each one owned and maintained by the user who installed it and each contributing its bandwidth to a communal, high-speed Internet connection shared almost as far and wide as Kaplan, from the top of the smoke­stack, can see. FunkFeuer is what is known as a wireless mesh network. No fees are charged for connecting to it; all you need is a $150 hardware setup (“a Linksys router in a Tupperware box, basically,” Kaplan says), a roof to put your equipment on and a line-of-sight connection to at least one other node. Direct radio contact with more than a few other nodes isn’t necessary, because each node relies on its immediate neighbors to pass along any data meant for nodes it cannot directly reach. In the network’s early months, soon after Kaplan and his friend Michael Bauer started it in 2003, the total number of nodes was only about a dozen, and this bucket brigade transmission scheme was a sometimes spotty affair: if even one node went down, there was a good chance the remainder could be cut off from one another or, crucially, from the network’s uplink, the one node connecting it to the Internet at large. Keeping the network viable around the clock back then “was a battle,” Kaplan recalls. He and Bauer made frequent house calls to help fix ailing user nodes, including one 2 a.m. rooftop session in the middle of a –15 degree Celsius snowstorm, made bearable only by the mugs of hot wine ferried over by Kaplan’s wife. Mesh networking is a relatively young technology, but the “magic” Kaplan talks about is nothing new: it is the same principle that has long underpinned the Internet’s reputation for infrastructural resilience. Packet-switched store-and-forward routing—in which every computer connected to the network is capable not just of sending and receiving information but of relaying it on behalf of other connected computers—has been a defining architectural feature of the Internet since its conception. It is what creates the profusion of available transmission routes that lets the network simply “route around damage.” It is what makes the Internet, theoretically at least, so hard to kill. 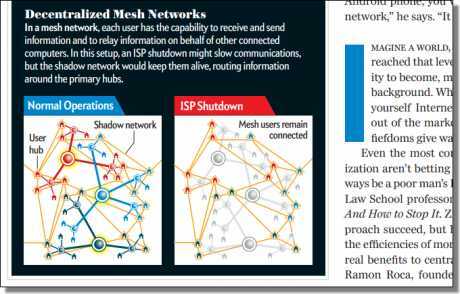 If the reality of the Internet today more closely matched the theory, mesh networks would be superfluous. But in the two decades since the Internet outgrew its academic origins and started becoming the ubiquitous commercial service it is now, the store-and-forward principle has come to play a steadily less meaningful role. The vast majority of new nodes added to the network in this period have been the home and business computers brought online by Internet service providers. And in the ISP’s connection model, the customer’s machine is never a relay point; it’s an end point, a terminal node, configured only to send and receive and only to do so via machines owned by the ISP. The Internet’s explosive growth, in other words, has not added new routes to the network map so much as it has added cul-de-sacs, turning ISPs and other traffic aggregators into focal points of control over the hundreds of millions of nodes they serve. For those nodes there is no routing around the damage if their ISP goes down or shuts them off. Far from keeping the Internet tough to kill, the ISP, in effect, becomes the kill switch. What mesh networks do, on the other hand, is precisely what an ISP does not: they let the end user’s machine act as a data relay. In less technical terms, they let users stop being merely Internet consumers and start being their own Internet providers. If you want a better sense of what that means, consider how things might have happened on January 28 if Egypt’s citizens communicated not through a few ISPs but by way of mesh networks. At the very least, it would have taken a lot more than five phone calls to shut that network down. Because each user of a mesh network owns and controls his or her own small piece of the network infrastructure, it might have taken as many phone calls as there were users—and much more persuading, for most of those users, than the ISPs’ executives needed. At 37 years old, sascha meinrath has been a key player in the community mesh-networking scene for about as long as there has been a scene. As a graduate student at the University of Illinois, he helped to start the Champaign-Urbana Community Wireless Network (CUWiN), one of the first such networks in the U.S. Later, he co-organized a post-Katrina volunteer response team that set up an ad hoc mesh network that spanned 60 kilometers of the disaster area, restoring telecommunications in the first weeks after the hurricane. Along the way, he moved to Washington, D.C., intent on starting a community wireless business but instead ending up being “headhunted,” as he puts it, by the New America Foundation, a high-powered think tank that hired Meinrath to generate and oversee technology initiatives. It was there, early last year, that he launched the Commotion wireless project, an open-source wireless mesh-networking venture backed by a $2-million grant from the U.S. State Department. The near-term goal of the project is to develop technology that “circumvents any kill switch and any sort of central surveillance,” Meinrath says. To illustrate the idea, he and other core Commotion developers put together what has been called a prototype “Internet in a suitcase”: a small, integrated package of wireless communications hardware, suitable for smuggling into a repressive government’s territory. From there, dissidents and activists could provide unblockable Internet coverage. The suitcase system is really just a rough-and-ready assemblage of technologies already well known to mesh-networking enthusiasts. Any sufficiently motivated geek could set one up and keep it working. The long-term question for Meinrath and his colleagues is, “How do you make it so easy to configure that the other 99.9 percent of nongeek humanity can do it?” Because the more people use a mesh network, the harder it is to kill. In one way, this is numerically self-evident: a mesh network of 100 nodes takes less effort to shut down, node by node, than a mesh of 1,000 nodes. Perhaps more important, a larger mesh network will tend to contain more links to the broader Internet. These uplinks—the sparsely distributed portal nodes standing as choke points between the mesh and the rest of the Internet—become less of a vulnerability as the mesh gets bigger. With more uplinks safely inside the local mesh, fewer everyday communications face disruption should any one link to the global network get cut. And because any node in the mesh could in principle become an uplink using any external Internet connection it can find (dial-up ISP, tethered mobile phone), more mesh nodes also mean a greater likelihood of quickly restoring contact with the outside world. Size matters, in a word. Thus, in mesh-networking circles, the open question of mesh networks’ scalability—of just what size they can grow to—has tended to be a pressing one. Whether it is even theoretically possible for mesh networks to absorb significant numbers of nodes without significantly bogging down remains controversial, depending on what kind of numbers count as significant. Just a few years ago some network engineers were arguing that mesh sizes could never grow past the low hundreds of nodes. Yet currently the largest pure-mesh networks have node counts in the low four digits, and dozens of community networks thrive, with the biggest of them using hybrid mesh-and-backbone infrastructures to reach node counts as high as 5,000 (like the Athens Wireless Metropolitan Network in Greece) and even 15,000 (like Guifi.net in and around Barcelona). The doubt that lingers is whether it is humanly possible for mesh networks to grow much bigger, given how most humans feel about dealing with technologies as finicky and complicated as mesh networks. Imagine a world, then, in which mesh networks have finally reached that level—finally cleared the hurdle of mass usability to become, more or less, just another app running in the background. What happens next? Does the low cost of do-it-yourself Internet service squeeze the commercial options out of the market until the last of the ISPs’ hub-and-spoke fiefdoms give way to a single, world-blanketing mesh? Even the most committed supporters of network decentralization aren’t betting on it. “This type of system, I think, will always be a poor man’s Internet,” says Jonathan Zittrain, a Harvard Law School professor and author of The Future of the Internet: And How to Stop It. Zittrain would be happy to see the mesh approach succeed, but he recognizes it may never match some of the efficiencies of more centrally controlled networks. “There are real benefits to centralization,” he says, “including ease of use.” Ramon Roca, founder of Guifi.net, likewise doubts mesh networks will ever put the ISPs out of business—and for that matter, doubts such networks will ever take much more than 15 percent of the market from them. Even at that low a rate of penetration, however, mesh networks can serve to “sanitize the market,” Roca argues, opening up the Internet to lower-income households that otherwise could not afford it and spurring the dominant ISPs to bring down prices for everybody else. As welcome as those economic effects might be, the far more important civic effects—mesh networking’s built-in resistances to censorship and surveillance—need a lot more than a 15 percent market share to thrive. And if it is clear that market forces alone are not going to get that number up much higher, then the question is, What will? The hitch, of course, is that it is just as easy to picture law-enforcement agencies denouncing any national mesh network as a place for criminals and terrorists to communicate out of earshot of the telephone and ISP companies that facilitate surveillance. Such are the complications of counting on government to support mesh networking when it is governments, often enough, that do the kind of damage mesh networks promise to help fix. It is doubtful, then, that governments can be relied on to do the job any more than markets can. But Eben Moglen has some thoughts about what might. Moglen is a law professor at Columbia University and for many years has been the lawyer for the Free Software Foundation, a nonprofit group of digital activists. Last February, inspired partly by the news from Tunisia, he announced a project called FreedomBox. He also announced he was seeking start-up money for the project on the crowdsourced funding site Kickstarter, and he went on to raise $60,000 in five days. As a project, FreedomBox has a number of similarities to Commotion, few of them entirely coincidental (Meinrath has a seat on the FreedomBox Foundation’s technical advisory committee). Like Commotion, the project broke ground with an illustrative prototype—in this case, the FreedomBox, a networking device about the size of a small brick that costs “$149, in small quantity, and will ultimately be replaced by a bunch of hardware that is half that cost or less,” Moglen says. Again like Commotion, FreedomBox is not tied to the form of any specific gadget. Rather it’s a stack of code that can go into the increasing number of networked CPUs that are piling up in our homes and lives, like “dust bunnies under people’s couches,” as Moglen puts it. All of these can become the infrastructure of an Internet that “rebalances privacy” and restores the vision of “a decentralized network of peers.” There are IP addresses in television set-top boxes, in refrigerators—any of these, Moglen says, could be a FreedomBox. And it is not just about decentralizing the infrastructure. It is about decentralizing data, too. For Moglen, for example, the concentration of user data in cloud services such as Facebook and Google is just as much a threat to privacy and freedom of expression as the concentration of traffic in ISPs. To counteract this trend, FreedomBox will be optimized to run alternative social networks such as Diaspora that store your personal data on your machine, sharing it only with the people you choose via peer-to-peer networks. Still, the key element in the project, Moglen says, is “the political will that is being displayed by a generation of young people who, because of their dependence on social networking, are increasingly aware of their and other people’s vulnerability online.” It is this earnestness he is counting on to motivate, in part, the many coders who are contributing labor to the project. It is also the one thing likeliest to push users to adopt the technology. Short of a sustained campaign of techno-activism, Moglen suggests, it’s not clear what will ever wake the average user to the broad costs in eroded freedom and privacy that we pay for ease of use and other, more immediately tangible benefits. This suggests that the reinvention of the Internet can never be just a matter of tweaking the technologies. It may require a political movement as broad-based and long-ranged as the environmental movement. If neither government nor markets can lead us there, maybe only a collective change of awareness will do, like the kind of change that the green movement brought about by force of will. Nobody recycled before. Now we do. Nobody uses mesh infrastructure now. Someday we might. Ta, pleb, timely post, just as they mobilise on all fronts to head off any potential breach in their info-domes. Work to be done. Interesting post, pleb, and a very welcome development. For once I agree with opus's view that it's a good thing. Truly libertarian in both the left and right wing usage of the word. However, I think that the type of governments that will oppose it will not be the "western" democracies such as US, Canada, EU, Aus, NZ, Israel etc but the various collections of dictatorial regimes who feel it necessary to restrict freedom of speech, in the interest of the common good of course. How might it work in the socialist paradise of Cuba where there is only one ISP, run by the single party communist government of course? Comrade Chavez with his unhealthy enthusiasm for media control might have issues with it too, I suspect. Not to mention the Islamic theocracies for whom freedom of expression is subordinate to koranic principles. And it wouldn't sit easy with the Chinese government approach to free expression though with the lT infrastructure that exists in that country it could well be unstoppable and a huge boost to Chinese democratisation and personal freedom. It is notable and ironic that the dominant worldview of most contributors on indymedia would appear to be far more supportive of those regimes that restrict freedom of speech than those that permit or even encourage it. Strange views for libertarians but sadly par for the course for many (not all) who self-describe as left wing. Freedom of speech is all very well but only for those who hold suitable approved views seems to be the order of the day. "However, I think that the type of governments that will oppose it will not be the "western" democracies such as US..."
You're an idiot contrarian. who do you think actually developed the repressive software to blacklist websites and make them disappear? Why do you think the US government insists on retaining full controll over the DNS system? which companies shopped the chinese dissidents to the chinese government? why american ones of course! Most western governments are doggedly trying to find ways to control the web. Your private emails and phone texts are currently held for 3 years or more in Ireland so the government lackys can have a read if you get up their noses. And google phil zimmermann / pgp to see how pissed these western governments get when someone finds a way to stop them reading all our mail.